The growing season in California's North Coast was rather cool, reminding winemakers of the trials and tribulations they experienced way back in.....1998! The season started late and was cool, for the most part. A lot of fog slowed ripening and it looked like another late and long vintage. Growers with modest crop levels managed to obtain fruit with mature flavors and plenty of sugar. Those who gambled on hot weather ripening a large crop found this to be a difficult vintage. 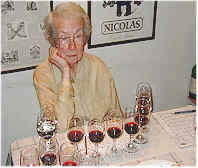 Many of the wines in this tasting had high alcohol levels. 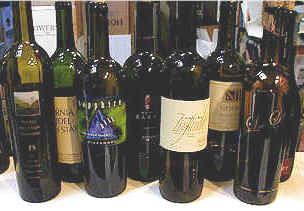 Wines weighing in at 15% are not uncommon. The curious feature of 1999, however, is the relatively cool weather retained reasonably high (for California) levels of acidity. 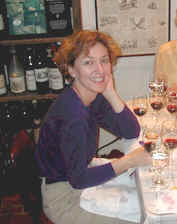 While, for example, many tout 1997 as a "great" vintage, the 1999s may surpass in quality and longevity other recent vintages. I found a crisp "edge" to the wines in this tasting, despite the high alcohol. If you can imagine tasting a good, tangy Sangiovese from Italy's Chianti region and translate that texture to a Zinfandel, then you'll have a good idea about these 1999s. Dry Creek Valley "Chiotti Vnyd." The wine was not showing well. Tasters complained of a sulfur stink, Brettanomyces, hydrogen sulfide, and, good heavens! Eau de Skunk and doggy-doo. One kind soul found plums, black fruits, tobacco, sage but high alcohol and out of balance. Another found lots of pepper. Bob found the same skunky, turn-off odor thoroughly bound up with the ripe Zin fruit, i.e. not blowing off with aeration. Jammy fruit emerges and oak comes up finally to sweeten the brew. Rubber tire (H2S) on the palate but some O.K. Zin fruit. He had tasted another bottle of the wine just days before and found extraordinary mocha and Zin blackberries. Gerald found dark chocolate, mocha, toasty, sweet wood which obscures the fruit. "I didn't find any of the objectionable, skunk or H2S notes others encountered." The wine found very few defenders. One taster found a tart wine tasting of stewed berries and a finish reminiscent of acrylic paint! Another found a wine that was tart, simple and diffuse. Others found it by turns vegetal, soapy and metallic. Another found an uncomfortable drying character to the finish, reminiscent of alum. Bob had a completely different take on the wine. Lots of spice! Zin bramble fruit and a nice ripeness to it with oak supporting nicely in the background; a bit simple but so nice! Zesty entry; very lively acid; trace tannins, and basically delicious! Not trying to be a Monster Zin. He also suspected that its context of fat, ripe, soft Zins threw the acidity into uncomfortably high relief for most of the tasters. Gerald's notes indicate "ripe and jammy...stewed fruits...mild tannins to this berryish, ripe red which is somewhat shallow." One taster found that it just got better and better as it opened up. Another found lots of intensity, berry flavors and hints of clove and cinnamon spices. Another found curious descriptors: unripe wild berries, Rutherford Dust, with talcum and spice box on the finish. Another found it metallic and bitter. Bob thought it a bit shrill, with sweet herbs and fruit reminiscent of Raspberry Life-Savers; cloying but, believe it or not, I could drink this! Quite tasty Zin fruit in spite of an edge of green stems and unripe berries. This was a love it or hate it kind of wine. One taster exclaimed, I love it! Another found it pleasant, simple with wild berries, smoke and a brandy-like edge. Another found vanilla, Kirsch, black cherries and candy with some complexity. Another found it hard and out of balance with weird herbal and cough syrup notes to it. One taster thought that it fell to pieces on the palate while another found it more characteristic of Gamay than Zinfandel. Bob found a dusty, candy-like edge but some really nice clean Zin fruit. I liked the little herbal note. Although mouth-filling at first it too fell to pieces for me rapidly. A note of Port wine was disturbing. Gerald describes this as having "Bright, zesty fruit with red berries and a grapefruit and spice note. Nicely proportioned, its flavors confirm the notes found in its fragrance. Two stars." Marjorie waiting for the rankings to be tabulated. Here was another decidedly controversial wine. One taster described it as a high alcohol Zin with notes of candy, waxy red fruits, mint and white pepper on the finish. Others chimed in with mint and eucalyptus too. Another found it a bit strange: loganberries, lavender, wild flowers and sage on the finish. Someone found lots of oak while another found low fruit and high alcohol. Bob was disturbed by an odor of garden dirt, a metallic edge and slightly shrill note that might indicate traces of volatile acidity. But there is a core of intense, ripe Zin fruit underlying it all. In spite of an odd mouth-feel (unripe berries, tannin) theres lots of nice Zin fruit. The earthy/metallic notes are not carried over from the nose. Gerald found the fragrance of this to be "Textbook Dry Creek Zin, with complex fruity and floral notes...nicely oaked and lots of aromas. The wine is still a bit tight on the palate, not showing quite as much depth, perhaps the acidity is not balanced yet. Two-and-a-half stars." Several tasters were much taken with this wine. Polished and well balanced, built on a fame of deep Zin fruit. Ripe and the richest of the Zins in the tasting remarked another. Others found cedar and currants but detractors thought it ultra-ripe, jammy, hot with low acid and possible residual sugar. Notes of sulfur and paper disturbed others. Bob found queer geranium leaf and plastic notes, then blackberry jam and an earthy metallic tone. But quite a tasty Zin mouthful! There was an odd, leafy edge to the fruit and a flat, uncomfortable finish. Gerald found "sweet red fruits: berries, especially raspberry notes on the nose. There are ripe berry flavors on the palate in this moderately tannic red...I marked it down for not being 'complete,' though it is quite good. One star+." Most of the tasters chimed in to praise this wine for its black cherry fruit, its complexity, its intense note of cracked black pepper and vanilla and its lingering finish. This is classic Zinfandel! Another described it as "low in acidity with some peachy notes...is there some botrytis here?" Bob added intense pure Zin fruit; quite ripe but no raisins, stewed fruit or jam; a sweet herbaceous tone and blackberries and more blackberries! Old vine intensity, deep, long, nicely balanced; a winner! Tannin comes forward as it opens up. It needs time. Gerald describes this as "Ripe, brambly, berry-like fruit with some spice and a touch of citrus...fairly aggressive on the palate, being a big mouth-full. It finishes a bit short and is a tad shallow. One-star." One taster loved the rich ripe fruit, the creamy oak, easy tannins and ripe berry fruit on the palate. Do I detect a portion of Petite Sirah in the Cuvee? Bob noted very possibly yes. Another fan of the wine liked its well balanced, ripe, juicy fruit with a hint of dried flowers potpourri. "Black licorice" was an element found by someone else. Bob found lots of oak here and big, ripe, just short of jammy Zin fruit; a bit dull but who could complain! Blackberries, nice secure acid, length, wood tannins but wood is in the background. Terrific wine! Gerald found "ripe and somewhat jammy notes...raspberry jam. Medium tannins and that jammy character shows up on the palate. One and a half stars."